The purpose of the Schoenl Family Undergraduate Grant for Dire Needs Overseas is to identify and fund the most outstanding projects which will serve dire human needs in countries other than the U.S. The grants must be used within a 12-month period to make an impact that will help alleviate dire human needs. The amount awarded depends on available funds and project scope. Typical grant funding is $1,200 for a Level I award and $1,800 for a Level II award. The application deadline is February 25. Project description: Deliver hygiene products and school supplies to children living in the Loi Tai Leng Refugee Camp. Project description: Created a Women's Safe Space in Jordan for refugees. Location: Belize Project description: Install a water filtration system. Project description: Free vision screenings for 1,500 children. Location: Ghana Project description: Install a clean drinking water system at the Augustine Larteh Anglican Primary School. Location: Lilongwe, Malawi Project description: Addressing food sustainability. Location: El Balsamar, El Salvador Project description: Construction of composting latrines (This project is in coordination with MSU Engineers Without Borders Club). Location: Dar es Salaam, Tanzania Project description: Drill a well and install a rain catchment system to provide water for drinking and other domestic purposes. (This project is in coordination with Spartans Without Borders). Locations: Kompong Speur Province, Cambodia & Kondal Province, Cambodia Project description: Gave individual farm families gilts to raise for smallholder swine farming in two provinces. The female offspring of the gilts will be returned to the program to sustain the Pass Swine On project by training and supporting new swine farmers. Location: Coimbatore, India Project description: Installed sustainable latrines that produce fertilizer for local crops. Location: El Balsamar,El Salvador Project description: Constructed latrines and sanitation with Engineers Without Borders chapter at MSU. Location: Ba Phnom, Cambodia Project description: Helped to complete a four-room school building and construction of a health center. 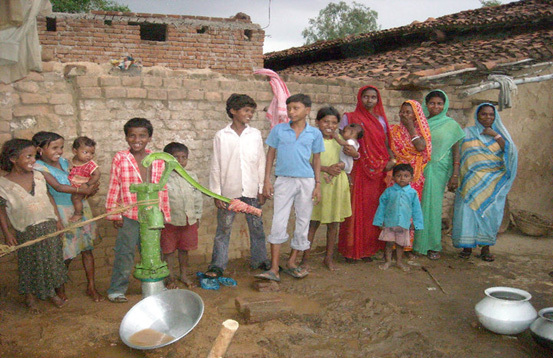 Location: Bedani, India Project description: Installed three community water pumps in the village.